TWO GREAT PRODUCTS COMBINED IN ONE FOR $1.00 SAVINGS. 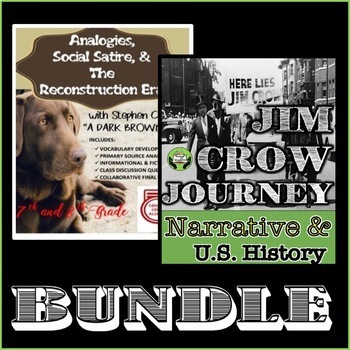 THROUGH INTERACTIVE FICTION, EXAMINE ACTUAL JIM CROW LAWS AND DEVELOP NARRATIVE WRITING IN THIS UNIQUE HANDS ON UNIT. Students will move from station to station deciding on how they would act if they encountered Jim Crow laws. 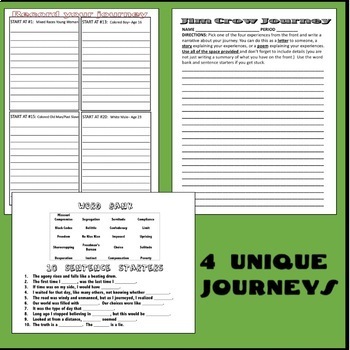 Once students have completed 4 unique journeys, they will write a story, letter, or poem detailing how it would feel to live during this time in history. Each journey is individualized by student choice on how they would react when faced with racial bias, segregation, and discrimination. 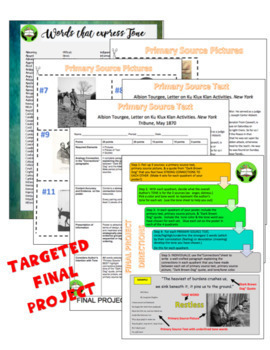 An amazing way to allow student to explore history through experience. A UNIQUE SHORT STORY COMMENTING ON AMERICA AFTER SLAVERY! Explore analogies, social satire, author's tone, and Reconstruction in post-slavery America with Stephen Crane's short story written in 1900 "Dark Brown Dog." The unit is aligned with Common Core and tackles some challenging concepts in the middle school English and history classroom. 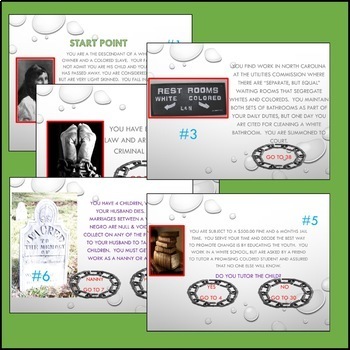 In addition, the story is engaging and unlike other short stories of this time period to ensure student engagement. -History Lesson on post-slavery America with informational text, video inclusion, and isolated key words. Combine English and history curriculum in your classroom today! WANT TO BUY THESE PRODUCTS SEPARATELY? Slavery, Reconstruction, & "A Dark Brown Dog"